Picture this: it’s World War 2 and a specific company (which in military terms, is made up of about 200 people) has successfully kept their ground on a very strategic place on the map. They’ve sustained regular air raids, while managing to stay strong and destroy waves of enemy troops. Despite their best efforts, and following all orders from leadership, the company can’t seem to take a critical enemy supply line to finally complete their mission. Their traditional attack patterns are failing, and the enemy is employing a new technology which isn’t fully understood. In light of this, the higher-ups have decided to send them some help. This is where most clients are at: they need help meeting their goals with processes and solutions which align to their strategy. Their critical mission could be the move to digital, the assembly of an in-house design team or reworking their current online presence for greater functionality. We are the help, and we usually take the form of a business consulting and/or design team. One of our main obstacles is that existing teams within the client organisation don’t know us, and the bigger issue is that they don’t necessarily trust us. They assume we don’t understand the deep and necessary context of what has been done and sacrificed to get to where they’re at. Obviously, they want to ensure that their deliverables are met, but just exactly how our approach – with its new language and artifacts (like journey maps and personas) – is going to help with this delivery is not always immediately clear to those unfamiliar with the concept. On the other side of this relationship, as consultants, we step into a project and environment which has developed its own culture and way of thinking. It’s now our responsibility to concisely and effectively convey our thinking, principles and methods which will ultimately build on and improve their legacy systems and thinking. How do we do this? 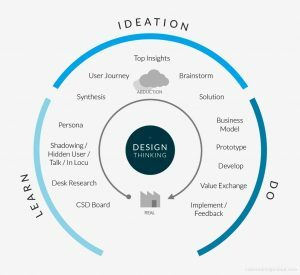 Design thinking is a holistic approach to addressing a problem or need. Simply put, it is the way designers think: the mental processes we use to design objects, services or systems. As a methodology, it should become part of the genetics of a business and/or design consultancy’s value proposition. It allows us to step away from only focusing on a shiny new product and solution, and focus on the people who are tasked to make this happen, the processes involved, and the people who will consume it. What’s even better, is that it slots in well with agile methodology. Walk in their shoes and get your hands dirty. User-centered design is all about focusing on people and building a deep sense empathy and understanding. Taking an active and genuine interest in the project, building open relationships with the stakeholders (from decision-makers to people on the ground) builds a sense of trust which is invaluable when the time comes to make tough decisions. Authentic empathy and trust allows the workplace to be more conducive to creative problem solving, and the efficient delivery of work. There’s nothing worse than being spoken at, or watching someone do an activity you don’t fully understand. Rather, invite people into the practical steps of the approach. Let them assist you in facilitating a brainstorm session, get their input on how you’ll go about usability testing, or maybe start a Slack group where you share design thinking and other cool learning materials with stakeholders. If we want to get people on board, we need to espouse the values of the design thinker by setting an example in the way we go about design and delivery, and one of these values is collaboration. When we build and refine our solutions on the go (as much as it is feasible), we can identify gaps in the design and even the overall strategy. This means we have an ability to iterate and improve on the solution as we move forward. The old school shies away from this, mainly due to the fear of wasted resources. As advocates of the agile and design thinking approach, we can counter this fear by focusing on the benefits of fixing small issues as they arise, without waiting for the entire application to be built, or strategy to be rolled out. By following the steps above, and staying true to them, I fully believe that UX design consultancies can more effectively integrate into their clients’ environments, win their trust, and add true value to their cause and strategy.